I swear, every time I look at Dreamwidth, a week has passed. I really don't know how that's happening, though I also don't know how we're already halfway through November. Here's a pic. It wasn't my design - I was reproducing an old jacket from the 90s. Anyway, now I get to sew for me! I wanted my first project to be fairly quick, no stress, and something small that I could take with me to sew at rehearsals. So I pulled out my new Simplicity Disney stuffed animals pattern, and I'm making Thumper. I think I've got the body a little more than half done at this point. I'm hoping I can do a tiny bit more today before rehearsal. After I finish that, I'm not positive what will come next. I want an S-bend corset, so possibly that. But I'm so far behind in my sewing because of the commission that I really should be getting on with my gala dress or something, which doesn't need the corset (that's for an Edwardian I want to make). But I haven't finalized what I'm actually making for the gala yet - all I know is that it will be yellow and 1890s. Or I could go back to the stripey 1880s bustle I was working on, but that was being a pain before which was why I shelved it. Or I could do the plaid 1830s dress I want to make, which would probably be the easiest choice. Fitting just seems like such a pain right now. Maybe once we open and I have more time to think and do things I'll figure this all out. Not much sewing has been happening here. Mostly, when I've had time to sew, I've spent it on the commission. But I also spent a good bit of time waffling around not doing much this weekend. I did do some alterations to a Simplicity winter coat pattern, and I think that with my alterations, I can just squidge it out of a piece of 60x86" bright blue wool I've been sitting on (I have two additional pieces about 20x60" each, for sleeves and a hood or collar, and another piece of similarly colored wool that I can use for the front and neck facing. I need to do a mockup, and I also need to pick up some lining fabric. I was told to look for bemberg rayon, which I think I can only find online, so it might be a bit till I can really start on this one other than the mockup. Other than the bemberg rayon, does anyone have opinions on coat lining (the coat is meant for about 30-40 degrees on average). 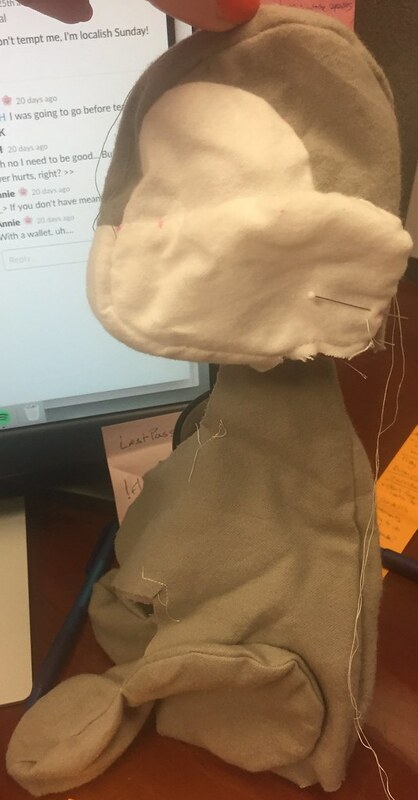 Anyway, it's tech week this week, and the next chance I'll get to sew will be Friday, and hopefully I'll get a chunk done on the commission then. One of the commission pieces is almost done, but the other one still has a ton left on it. I also think I'll have another commission coming in shortly, so I may not get to do anything for that Regency ball I mentioned at all. My plan for it at this point, though, is to re-dye some rayon/silk velvet I had in the stash and make a super simple over-robe out of it. Though to be honest, that idea doesn't really thrill me. It's all done! I didn't make to the post office today, but it will head off to my customer tomorrow. I rather enjoyed it, for the most part, since it was a nice easy project (besides the zipper of course). The dress is cotton, with a poly matte satin sash, and matching bow. The sash is actually made out of three pieces - the part that is attached to the dress and goes around the waist, which is cut on the bias and top-stitched to the bodice, and then two ends, which were made double width and turned into tubes to tie into a bow. The bodice is based on a jenky looking McCalls princess pattern, but I changed the darts a little, and cut the neckline lower and wider. The skirt is just three flat panels (two halves in back, one whole in the front), and the dress closes with an invisible zipper up the back. It's entirely machine sewn except for the CB of the lining, which is handsewn down along the zipper. There's also a matching hairbow out of the satin. I worked on Wendy all day, and it is very close to being finished. All I have to do is tack down the lining along the zipper, but it's late, so I'm leaving that for tomorrow. I would have gotten to it tonight, but naturally the zipper was being a pain, and I had to redo it because the attached sash at the waist wasn't lining up. But it's fixed now, so I'll probably only need to spend about 20-30 minutes more before it's completely done. It's turned out really cute! And this also hopefully means that by tomorrow evening, I can start on my bustle gown! I'm feeling a bit better about my sewing progress now! Yesterday, I cut out the rest of the bodice interlining and silk bodice pieces, and assembled the whole bodice. Then I made a mockup of the bertha, and since it seemed fine when I pinned it on, I went ahead and cut it out of the silk. Of course, as I was cutting it out, I had an "oh crap" moment, when I realized that I hadn't taken into account the facing for the bertha, and there was no way I had enough of the ivory silk left for it. Luckily, I have a dark cream shantung, that, while it is a few shades darker, should be fine for the facing unless my bertha flips way up. So I cut it out, and pinned the two in place, and started marking my triangle seam lines, and I found an amazingly easy way to measure them! I don't know if this is just something I had never learned, or if it's some new thing I stumbled upon, but I realized that if I took my 3" wide plastic quilting ruler, and positioned it so that the 2.5" mark was on my CF dot (which was .5" up from the edge of the bertha), and put both 3" marks on the edge of the fabric, I could go around the whole rounded bertha piece, always using a 2.5" mark as a placement, and getting perfectly measured 90-degree spaces between each triangle! It made it soooo much easier! So anyway, I sewed and turned all my triangles, and serged the top edge, which means the bertha is ready for trimming. I'm going to sleep early tonight, so none will get done now, but I'm really hoping that by the time I get home, I can finish the two rows of trim on the bertha, the 5th row on the skirt, and the last overskirt tab. Because then I'll feel sooo relieved. Especially because I just signed up to take a 4-day, 6 hrs per day class on draping a Victorian bodice the week before I leave for CoCo. Maybe not the best decision, but the class signed up super fast last time, and it's only $15. I couldn't pass it up! I used a decorative stitch for the front opening and sleeves of the blouse, satin at the collar base, and my trust satin with the overlock foot for around the top of the collar. I learned that trick with the regular Anna! The neck opening closes with three small hooks and eyes. Yesterday, I digitized half of the skirt motif. They're so large that I unfortunately can't fit the sunflower in one hoop (about 13.75"), so I have to do sunflower heads, and then the stem/tulip area separately. And there's 16 of each! And because I fell asleep so early (11:30, which is about 3.5 hrs early for me, and my prime work time!) I also didn't get any of my pleats done. So the goal for today is to finish digitizing Anna, cut and assemble the skirt, so I can let the circle hang, and get all my overskirt pleats done and attached. We're coming in to vacation crunch time, and I need to prep for handsewing! I got really excited thinking I had finished the Anna blouse tonight, and then I realized I still need to sew on a few hooks and eyes at the neckline. But it's almost done! I'll finish that tomorrow morning, and then post some pictures. I also finished the Elsa skirt. Still not in love with the dye job, but I think it's as good as this fabric is ever going to get. Tomorrow I also hope to finish all my Victorian child overskirt pleats and attach them, and cut and iron my trim strips so that I have plenty of handsewing to do while I'm in CA next week. If I can get a bodice mockup made up, then even better! I shipped my etsy order, bought a giant pot for boil-dyeing at Walmart, bought fabric, zipper, and dye at Joanns for Anna and Elsa, went to the library, bank, and Walgreens, and finished the Anna bodice. I also redyed the skirt. I waited til it was fully dry before I rinsed it, and it seemed like not much dye ran off. It's drying now, so I won't know till the morning if it was actually a real success or not. Once I finished the bodice, I also prepped my pleat strips for the Victorian child overskirt, and pleated up two of the seven tab sections. They're still pinned at this point, but I think I'm only going to be able to do one or two more sections before I'll have to sew them in place, so that I have enough pins to pleat the rest! Most of my silk pins are currently in the zigzags of the skirt - it's amazing how many pins this project requires. Tomorrow I'm finishing the waistband on the Elsa skirt, and starting the Anna blouse. What's the chance it will go so smoothly that I could finish it tomorrow, too? Whoops, forgot to post yesterday! I finished the vest yesterday! I also cut all my bodice pieces, and redid the embroidery for the front of the bodice. It's so much better now! Today, I serged, assembled, and boned the bodice, and I sewed the binding on one side, and pinned the zipper in place. All I need to do is stitch the zipper in, and flip and sew the binding into place. So I should have it done by mid-day tomorrow, and then on to the blouse. I also tried another attempt at dyeing the Elsa skirt today. It took dye better than it has before, but either it wasn't in the dye long enough, or it wasn't enough dye, or both, because although it looked pretty great when it was wet, it dried so much lighter. I'm going to try picking up two more bottles of dye tomorrow, and give it one last go. Otherwise my customer and I have just decided to call it good. At least I'm only hitting Joanns every other day? I also have to drop some fabric off at the post office tomorrow, since someone bought some of my Harry Potter fabric. Yay for more etsy sales! I did a ton of embroidery today. I finished all of the vest embroidery, and it turned out amazing. My machine played nicely, everything lined up great, and the stitches were all digitized perfectly, too. I cut out the vest pieces, and serged them, but I have yet to actually assemble them. The front, and how it looks from the side. Once it is assembled, I'll be connecting the yellow satin stitching over the seam, and adding more of the satin stitching up and around the back of the neckline. Today was quite a day! I had an audition at 11:45 in Seattle, and a dentist appt also in Seattle at 2pm. Since I live almost an hour away, I decided to go to Starbucks and work on my Anna digitizing (I smartly brought my laptop). And by the time I left for the dentist, I had finished as much of the digitizing as I could do without my printer! Then, of course, my dentist appt went super quickly, and I had a rehearsal at 7 in West Seattle. Since I had also brought my hand sewing with me, I decided to just hang out for 4.5 hours in West Seattle, instead of fight traffic both ways. So I worked on my skirt, and I think I wound up getting about 1/4 of the fourth row done. When I finally got home after rehearsal, I finished all the digitizing. I'm really happy with how it looks, though I've realized I'm going to have to do this the old-fashioned way, and embroider on the fabric before cutting the pieces out, like an 18th c waistcoat. Otherwise it's going to be sooo hard to perfectly position the pieces in the hoop, even with my machine's camera. Each piece is almost 8x12, which is the size of my largest hoop, and it's going to require five hoopings total to complete the vest (and a 6th for the bodice). I just hope it all works out - the vest is 61481 stitches, and that doesn't include the parts that I'm just going to satin stitch with the sewing machine. I finished the third row! 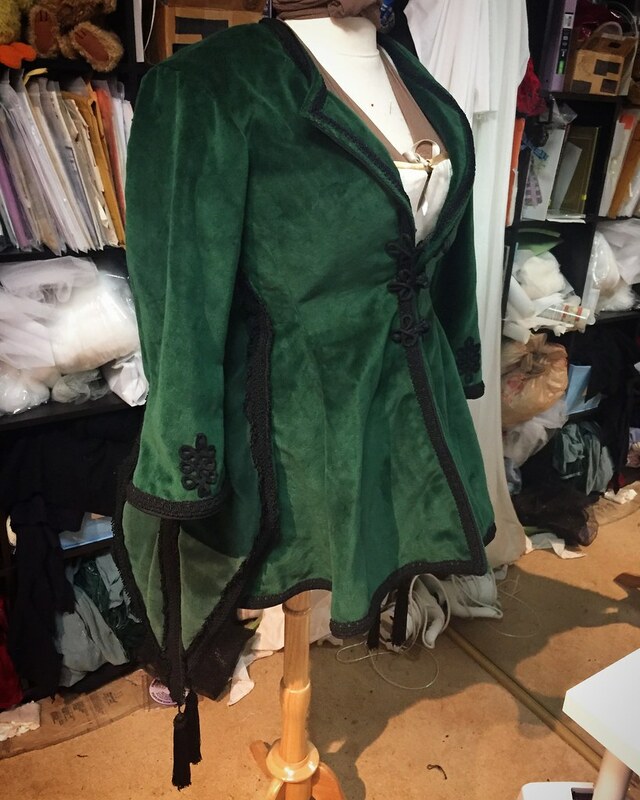 I didn't wind up starting the bodice yet, though, because it's looking like I'm going to have a rush commission of Anna's Frozen Fever bodice, blouse, and vest. So tonight I knocked out the digitizing for the big sunflower motif on the back of her vest. What with this new commission, I'm going to have a whole ton of sewing to do in the next two weeks! I want to sew. More specifically, I want to start my black silk bustle gown. I know this would be silly to start right now, though. For one thing, I'm expecting an Elsa skirt fabric delivery on Thursday, which means I have to start the Elsa skirt commission when that arrives (luckily it's just a skirt, no bodice or cape, so it shouldn't be too bad). I need to finish the skirt and ship it off before the house closes. So basically, it needs to be shipped on Dec 12th at the latest. And then of course, the big reason is that I'm moving, and as evidenced by the stupid Titanic ufo (I'm mad at it now), it's a bad idea to move with incomplete projects. Not to mention the fact that any spare minute not working on the Elsa skirt should be spent packing. All I managed yesterday was a half a box of books. Fail. I've decided to go with professional movers, so at least I don't have to stress about actually moving the boxes myself, but there is still so much packing to do. I have no idea how I wound up with so much stuff. I suppose if I really want to do something sewing-related tonight, I could find my Elsa skirt pattern. Or go to Joanns and buy lining. Though I was hoping to wait till after the skirt fabric arrives to do that. Unfortunately, I don't think I have enough left over from the last time I made it.